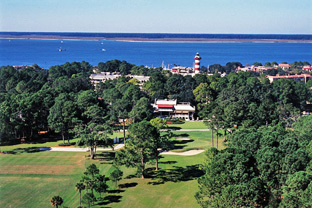 There are few real estate opportunities anywhere as attractive as real estate in Sea Pines. As the original planned community on Hilton Head Island, Sea Pines acts as the model for all other gated resort communities across the country. One of the unique features of Sea Pines real estate is its diversity and its appeal to primary home owners, investors, or those looking for a second home. From oceanfront homes, golf course oriented homes, an array of villas, and homesites – the options are endless when looking at Sea Pines real estate. Sea Pines encompasses 5,200 naturally beautiful acres located on the southern end of Hilton Head Island. There are 5 miles of scenic Atlantic Ocean shoreline in Sea Pines Plantation and 12 miles in total on Hilton Head Island. Sea Pines Plantation has a 605-acre Forest Preserve; 4 golf courses including the famed Harbour Town Golf Links, home of the RBC Heritage Tournament and the new Heron Point by Pete Dye; an abundant supply of tennis courts, 2 marinas, 15 miles of leisure trails, an equestrian center, pristine beaches and a multitude of water sports. There is also the 60-room Inn at Harbour Town, 2 Conference Centers and a wide variety of residential rental properties dispersed among its 5,200 acres. Last but not least is Harbour Town itself. Harbour Town is home to Hilton Head’s best boutique shops, art galleries, restaurants, a children’s playground and the famous candy-striped lighthouse. The Sea Pines Real estate offerings allow you to become part of this truly wonderful Hilton Head Island community.